Yes, notes are a good thing. I put the dotted line and bend on there so I didn't cut it off at that line. Did you also notice the top and bottom markings?? I put those there so that when I bent it I would be bending it the right way, so all the holes that are marked and cut are on the right side of the car. I usually stay up at night and think of all the things I need to do the next day, how to bend this, how to cut that, how to do this... Then the next day I am too tired to do it. Yesterday I went to the club member house and we put several bends in the metal. The floor panel has two 90 degree bends on each side and I will have to bend the front at a 45 degree angle to meet the firewall. I had another piece of 16 gauge that we bent 45 degree angles on each side that will be cut off and welded to the rear of the floor panels to meet the rear of the tub. I also had a 18 gauge piece that I had cut to the approximate size of the side panels and we bent 90 degree bends in them for the bottom edges. One I got the panels bent I started to cut out the battery box hole and that's where things got good. The blade for the craftsman saw broke and last night I went shopping for new blades. Went to the local hardware store and they had no blades that would fit a Craftsman saw (has a "t" type mount), so I decided to go to Kmart as they sell Craftsman tool. Only blades they had there that fit were for wood, and only one pack at that. As we were leaving Kmart my wife said lets try Giant Eagle, as they had just opened a Ace hardware. Went in and they had the best selection of blades of all three stores, having the blades that I needed for my Craftsman saw, and several different blade types too. Talked with the gentleman there and he also said that Giant Eagle also exchanged broken tools there. Hard to believe that Giant Eagle has more hardware than a hardware store! Today put the new blade in and finished the cut on the battery cutout, looks good. How is the Hoss's in Hummelstown? Hope they didn't get flooded again. The lower switch might also be for the lights, Park, Running, Bright. More progress to report on the FOR today. I checked the floor panel from my brother in laws FOR on my frame and all but the two frame holes lined up perfectly. Must have had a fairly good jig at the Crosley factory... Of course, my brother in laws FOR and mine are only 2 numbers off on the serial number. Made the adjustments on the new floor and I should be good to drill all the holes. I started cutting out the shifter and PTO holes and also got the side panels rough cut out so I can get the 90 degree bends put on the panels. The club member has a brake and it has a 42" maximum and I can take the metal to his place to bend them so I wanted to get as much ready as possible. Hopefully in the next day or so I can get them bent and proceed with fabricating the tub. Laying out the new floor pans for the FOR today, 16 gauge cold rolled steel. I was hoping to have the metal shop where I bought the metal put some bend on them, but they didn't have a brake. Was talking with a fellow club member and he said he had a brake that might be able to bend it (not sure if it was long enough). I am using the old floor from my brother in laws FOR, so I hope the holes are in the same place. Once I get the sheet all marked I think I will lay it on my frame just to make sure the holes line up. Feels good to be back at it. Well, it is time to get this thread back on track. I picked up several sheets of 16 and 18 gauge sheet steel to redo the tub and missing hood on the FOR today. So hopefully I can start cutting and bending it this week and get this show back on the road! Stay tuned. July 12-14 we were at the Crosley National meet in Wauseon Ohio. We took the Cow car, a 1946 Crosley sedan that has been primed to look like a cow and it has horns. I hadn't had it out to the nationals since the last time CC's (1946-1948) Crosley's were the spotlight class. Took some work to get it running again. As you might be able to tell I like to have fun with the cow car... Everyone enjoyed it and we even had cow tails to give away! 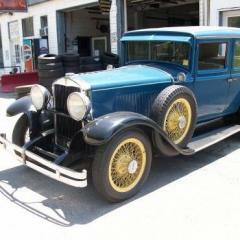 I hope to get the Hupmobile and Crosleys to a couple show and cruises this weekend also. Took the Hupmobile to its first show in about 20 years! Was quite the hit at the memorial Day car cruise to benefit the Children's Hospital Free car fund that our club runs. Lots of other nice cars there too. Hupp ran good to and from the cruise. 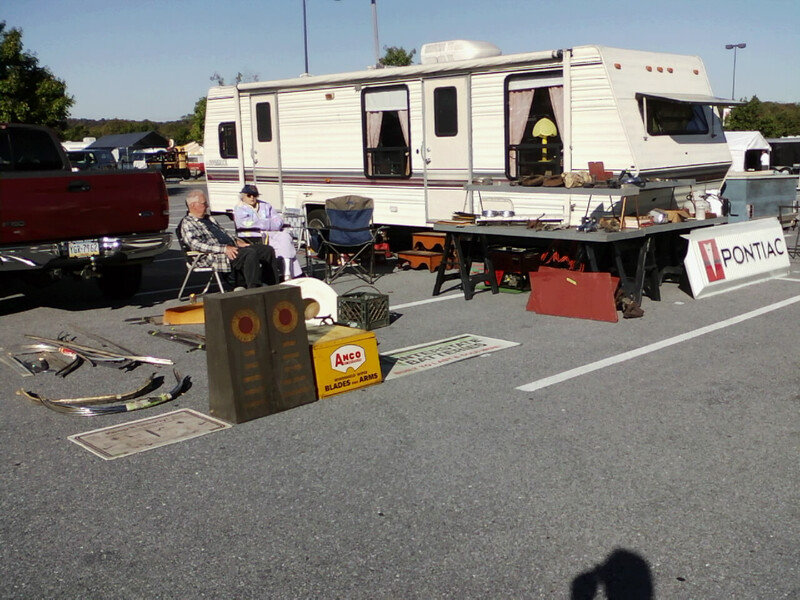 Also had the 1949 Crosley Hotshot and the 1977 Covette there. Well, it happened!!! I got the Hupp out and took it for a short run down a side street today! Wasn't a long run, but it ran pretty good!! Felt good to be behind the wheel and driving it. Now to get it to it's first car show in years. Looks similar to a Hupmobile. I'm looking for the fitting that mounts to the filter. Still working on the Hupmobile and Thunderbird. I got the hood and fender installed on the Thunderbird today and freed up the cart, so I hope to put the FOR back on it and start back on its restoration. 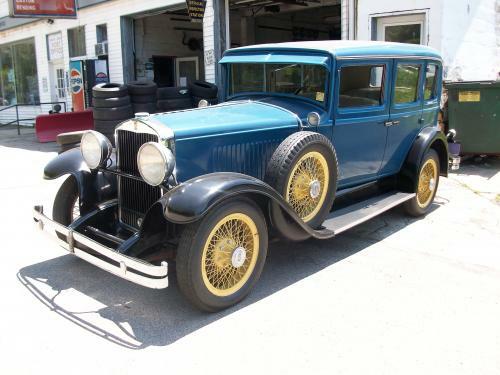 I installed a new generator cutout on the Hupmobile and fired it up and the generator is charging as it should be so now it is time for a test drive. Will be the first time behind the wheel of it and I am excited!! Installed one more hubcap, so now the passenger side is complete. And I am in charge of making the dash plaques for our car cruise on Memorial Day so the wood is on the running boards, any flat surface in my garage gets stuff laid on it. Just to finish off this thread: I bought a replacement cutout and now the generator is charging as it should. Now it is time for a test run out on the road for the first time in years and my first time driving it. Thanks for all the help. All is well in Hupp Land!! Crosley or Corvette??? If your looking for driving fast and being with the "in" crowd, it is the Corvette, but if you are looking for fun all around it is the Crosley hands down. Everyone has a Corvette, go to a car show/cruise and they are everywhere. Not everyone has a Crosley and at shows you can't see the Crosley for all the people flocked around it!? I speak from experiance, I have a Corvette and a few Crosleys. More work on the Hupmobile and the Thunderbird. Finally got good enough weather to paint the hood and fender on the Thunderbird. Now to repair the bumper cover and put it back together. Once I get it back together I can resume working on the FOR as the cart will be free from Thunderbird parts. Was working on the Hupmobile trying to get it ready for a car cruise this weekend. I drained the transmission and refilled with grease and topped the rear end off. I put a filter on the fuel line ahead of the fuel vacuum canister thinking there would be rust and dirt in the fuel tank, well it seems to be spotless as the filter is clean after running it for about 30 minutes, but the car would stave of fuel and after checking things out the fuel bowl was empty. After checking out a few things I discovered the vacuum canister was rusty inside, so apart it came. cleaned it up and now it seems to be running good. I am slowly installing the hubcaps and it is looking pretty good. Unfortunately, I don't think I will have the Hupmobile at the cruise this Saturday as I need a generator cutout and will have to order one. I did find the oil filter but there is a problem with it, the fitting on what I think is the bypass value is broke off. It would be nice to have the filter on the car, just so I can show off the old style filter, so if anyone has a fitting like in the picture let me know. Otherwise I will mount the filter just for looks and bypass it as it is now. Yes it is a 3 brush generator. All I know is it was working when the car was put away about 15 years ago. Thanks for all the replies. This cutout has two connections, one from the generator output and one from the wiring harness. So, with the cutout off the car and base of the unit grounded, if I momentarily put 12 volts to the generator input side of the cutout it should close the points? Paul, I have bought the Hupp from my dad, couldn't see to let it go from the family after being a part of it for almost 50 years. Just doing a few things to it to make it mine and then I plan on driving it some. Put the first hubcap on the Hupp today. It is an original that was in pretty good shape and the chrome wasn't too bad so I just painted the cap and installed. One down 5 to go. Looks pretty good... On a side note, if you look at the spare tire that the hubcap is on you will note that it was made at the Pennsylvania Rubber Co. in Jeannette, PA, which is just a hop, skip, and a jump from Vandergrift PA. Happy Birthday John, Have a great day!!! !